As the trend for vintage-style, afternoon-tea-inspired homeware continues apace, local business Constance Wallace is expanding rapidly thanks to owner Diane Cooke’s many ideas based around the traditional tea-party theme. As well as selling a growing selection of vintage and handmade items in the cosy little shop at Tardebigge Court, Diane has seen a big increase in demand for her tea parties, where she brings vintage china, refreshments and pretty decorations to clients’ homes or party venues. 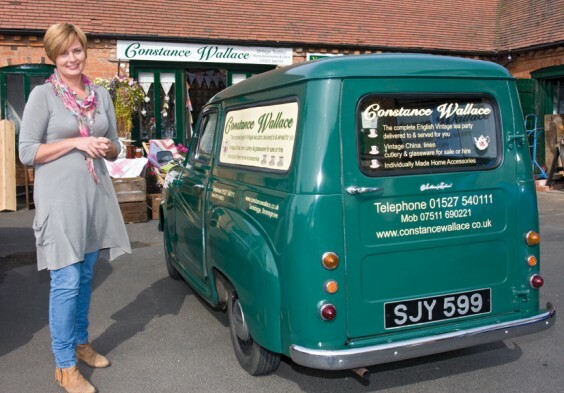 Most events are in the local area, but Diane has also travelled further afield to Pedmore, Harborne and Worcester.In fact, she now does so many parties that she decided to buy a vintage vehicle in which to transport her wares… enter “Peggy”, the 1958 Austin van! Peggy is named after Diane’s old pet dog, in keeping with the family theme – the business is named after her parents. The acquisition of Peggy enables Diane to offer even more parties, and her latest idea is to offer a vintage party plan – much like the Tupperware parties of old, but instead selling china, handmade blankets and cushions. With Christmas coming up, Diane can tailor a tea party to a winter theme with mulled wine and mince pies. The shop itself is always busy, with customers returning to buy more, and the layout has been rearranged to give extra space as the stock increases. The collection of vintage china and tableware, which can be hired as well as bought, is topped up regularly with visits to house clearances and the occasional antiques market in London. Every conceivable nook and cranny is full of pretty things created by Diane, who has an MA in printed textiles and can turn her hand to anything from painted cushion covers and crocheted blankets to patchwork pinnies and skirts made from vintage fabric. Padded fabric heart decorations dangle in the windows alongside tea cups suspended on strings, and fabric bunting crisscrosses the shop – Diane makes this to order in different colours for people’s own parties. There are also vintage suitcases, which she is covering with fabric, giving them a new lease of life as she does with so many old items that others might simply throw away. Vintage linen tablecloths also benefit from Diane’s creative flair; if they are not spotless, she dyes them in contemporary colours and embellishes some with decorative buttons. The shop is usually open from 10am to 5pm Tuesday to Saturday , but it’s advisable to ring before making a special journey just to make sure Diane will be there.